The European Union voted yesterday on the authorisation of three GM corn varieties. 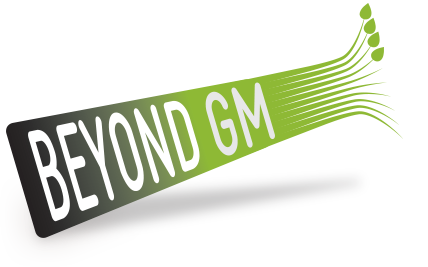 The success or failure of that vote isn’t straightforward – but it definitely isn’t (yet) a ‘win’ for anti-GM campaigners. The vote, by the Standing Committee on Plants, Animals, Food and Feed, was on draft regulations for the reauthorisation of one strain of GM maize (Monsanto’s Mon810) and the authorisation of two new strains of GM maize (Dow-DuPont’s TC1507 and Syngenta’s Bt11). All three crops have all been engineered to produce their own insecticides, which are derived from those produced by a soil bacterium, Bacillus thuringiensis (Bt). The Bt toxin kills the larvae of specific insect pests, such as the European corn borer, but has also been shown to harm non-target insects as well. In addition, TC1507 and Bt11, are also genetically modified to withstand spraying with glufosinate. It’s important to note that the applications for the authorisation of TC1507 and Bt11 have been ongoing since 2001 and 2003 respectively. In addition, MON810 was originally approved for cultivation in the EU in 1998 and is currently grown in Spain, Portugal, the Czech Republic, Slovakia and Romania. It has been awaiting re-approval since 2007. Had this this vote swung in favour of authorisation, TC1507 and Bt11 would have been the first new GM crops authorised for cultivation since 1998 (the exception being the Amflora potato which was briefly approved then withdrawn in 2013). A majority of national governments rejected these maize authorisations but there was no qualified majority (i.e. 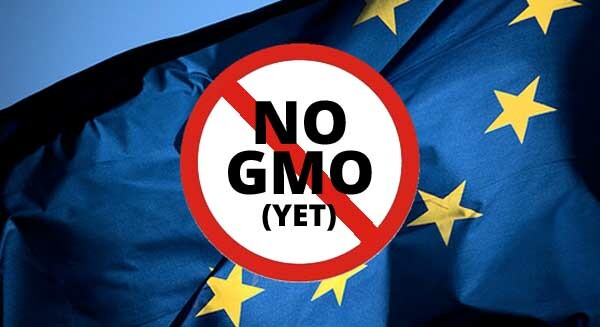 at least 16 EU Member States representing 65% of the population), which is necessary to ban the GM crops outright. The continuing inability of EU Member States to agree on GMOs shows up serious flaws in the so-called ‘opt out’ approach to GMO crop​ regulation. In 2015, an opt-out for GMO cultivation ​was agreed between the European Commission and Member States in an attempt to avoid such a stalemate. The Commission hoped that giving individual Member States the right to opt-out of cultivating (on a crop by crop basis) approved GM crops would dissuade them from blocking the approval of crops which had passed the European Food Safety Authority (EFSA) evaluation process. ​​​But yesterday’s vote shows it’s not working. In fact, the vote followed the established pattern of around a third voting against GMOs and a third voting for, while the other third are habitual abstainers (although the actual percentages can vary). The options open to Commission are to send the authorisations to a so-called appeals committee, or change the details of the proposed authorisation and put it to the vote again. ​It if takes the former path, it will likely be in the spring; if the latter it could be re-presented to Member States for a vote as early as next month. Should the new authorisations get through, for instance on appeal, they can then be grown in the 9 EU countries, and three regions (England in the UK, Flanders and the Brussels region in Belgium), that did not opt-out of cultivating these varieties. ​In all the political wrangling it’s easy to forget that the Commission also has the power to simply reject the GMO maize authorisations itself, but has always shown the utmost hesitation in using it. This is because the Commission has simply not wished to face political unpopularity in the heartland countries of the EU by opening up Europe’s fields to GMOs. The shambolic, tortuous and borderline unconstitutional opt-out scheme was developed solely to let the Commission off this hook. Commissioners and officials must be frustrated and bitterly disappointed to find themselves still hanging, and they might respond with action rather than their habitual hand ringing and hoping something else shows up. However, given the general dissatisfaction with the Commission throughout the EU it’s just as likely that it will be continue to be cautious about creating more unpopularity, especially as EFSA and its evaluation processes are under attack for lack of transparency and over-reliance on industry-funded research and influence on its advisory panels. EFSA has been heavily criticised for its handling of the re-licensing of glyphosate – the so-called ‘active’ ingredient of the world’s most widely used herbicides and, as Roundup, at the core of most of GM crops. The evaluation of these latest applications, once again has relied heavily of industry studies and there has been widespread criticism that in the cases of TC1507 and Bt11, EFSA has ignored significant gaps in data regarding its safety for humans and the environment. The Commission is also in a mess over a similar Member State opt-out for imports of human and animal food, which was first proposed in April 2015 but remains highly unpopular. Although late last year the Commission sent national governments a confidential legal opinion analysing the proposal and reportedly showing why it was the best option, it is likely to remain in legislative limbo for some time to come. Friday’s vote has been welcomed as a victory by those opposing GMO crops – but a closer look should cause them concern. The Member State bloc willing to approve is significant even for crops which are not of major interest to farmers across the EU​and which do not engender public interest let alone support. 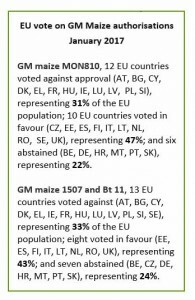 Looked at as a percentage of the EU population, represented by those Member States who voted, around 40% were in favour of GMO crop authorisation, whilst those opposing is 30% (see right). Presented with a more politically palatable crop – a blight resistant potato which could reduce pesticide use, for example – the number of Member States willing to give approval would likely rise; and, shambolic as it is, the opt out scheme gives abstaining States political cover to shift position and tip Europe into greater acceptance of GMOs. 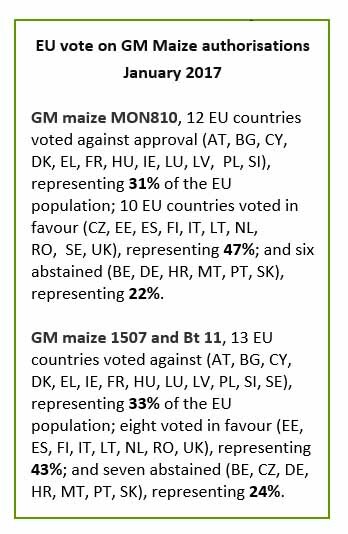 UPDATE: On Monday March 27 EU Member States voted, but once again failed to reach a qualified majority on the approval/renewal of the GM crops in question. This means that, even though the majority of countries voted against the authorisations, the decision will now return to the European Commission.